At Frontier Basement Systems, we use foundation helical piers for structures that are showing damage from settlement. We serve Jackson, Nashville, Clarksville, Murfreesboro, Owensboro, Philpot, Bowling Green, Fayetteville, Marion, Utica, Leitchfield, Franklin, Mcminnville, Paducah, Shelbyville, Hartford, Antioch and many nearby areas in Tennessee and Kentucky. We Do Helical Pier Installation in Tennessee and Kentucky! At Frontier Basement Systems, we want to help you restore the value of your home through structural stability. To this end, we have a wide variety of repair solutions that can address foundation problems of any kind. If you live within our Tennessee and Kentucky service area, we'd like to provide you with a free, written helical pier installation quote. Each quote includes a free on-site inspection, a professional consultation, and copy of our 90-page full-color foundation repair book. To schedule your appointment, call or e-mail us today! 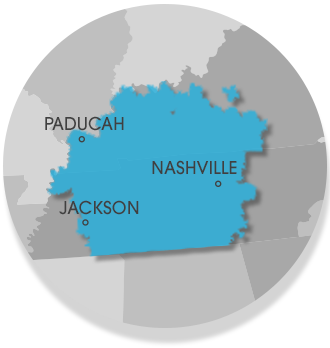 Our service area includes Clarksville, Nashville, Jackson, and nearby areas such as Owensboro, Murfreesboro, Bowling Green, Philpot, Utica, Fayetteville, Marion.